Bar Bistro Down Royal Park Golf Course ARE YOU A SUPPLIER? Bar Bistro at Down Royal Park Golf Course is a wedding venue with vintage elegance that is sure to make your day unique and unforgettable. Located between Lisburn and Hillsborough, Bar Bistro is encircled by the spectacular Down Royal Racecourse and fairways of Down Royal Park Golf Course. The serenity and tranquillity of the countryside coupled with the magnificence of Bar Bistro provide a fabulous setting for a wedding. Bar Bistro will offer you two fabulous function rooms which boast splendid high ceilings, intricate stonework, and gorgeous dark oak wooden trusses. 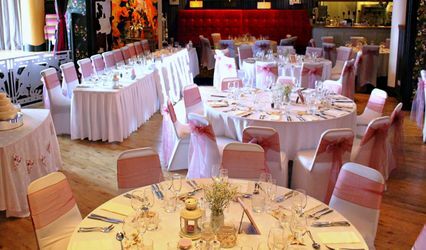 It has retained its original features and charm, making it an extraordinary space for a wedding celebration. The main Bistro area will provide your guests with a glorious view of the golf courses and makes for a lovely area for a Banquet style wedding. It has an adjoining outdoor terrace which has become a popular spot for BBQ suppers, especially at summer weddings. 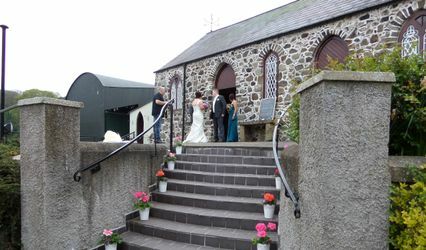 This entire venue can be made yours on hire for your wedding day. To ensure that your day is special, Bar Bistro will cater to only your wedding on your chosen day and will offer you a bespoke wedding package. The passionate and experienced team at Bar Bistro will customise your celebration to suit your style and meet your requirements. They will lend you a helping hand while you make the all-important decision regarding the menu on your special day. Their professional styling team will understand the vision you have for your day, offer you brilliant suggestions and transform the wedding of your dreams into a reality.